What is the paint color and brand? I agree, I love this paint color. Also I like the red stool and the grey sofa. Any idea as to the source of those items? Houzzers, we made the call and you answered, showing us the dramatic difference you've made in your homes with paint. Today we're looking at how paint has changed your rooms, from the kitchen to the bedroom, from the living room to the laundry room. Accept Lighting This room shows the accept lighting which is from a cloudy day. There is no sun lighting. It is just coming from the natural and show some place on the picture are really showing up and some of the is not that obviously. The new colors are Ralph Lauren's Smoked Glass and Tibetan Jasmine. "The Smoked Glass is a beautiful, dynamic color that changes throughout the day," she says. 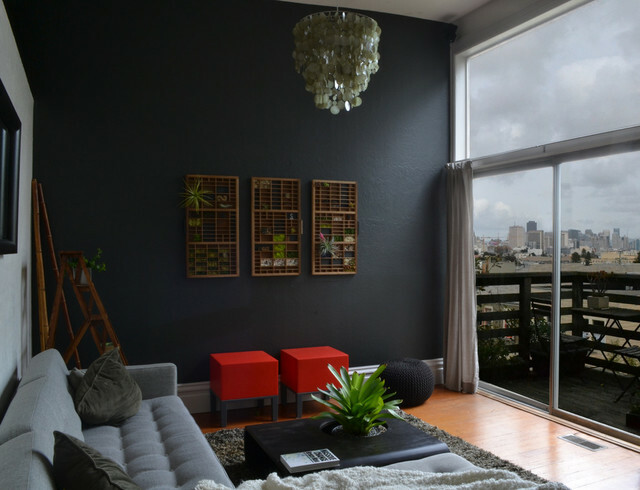 Dark paint adds an element of drama to a room.